As an author, event planner, teacher, wife, mom of 10 and grandmother to 2, September McCarthy has plenty to fill her days. She relates to the universal exhaustion on our mom souls–the beating ourselves up and the fighting for joy. 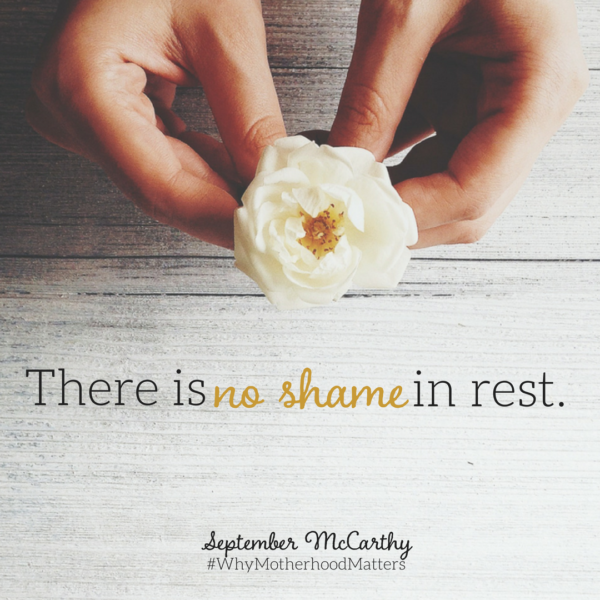 September has so much wisdom to share from what God has taught her in seasons of busyness and motherhood in different stages. 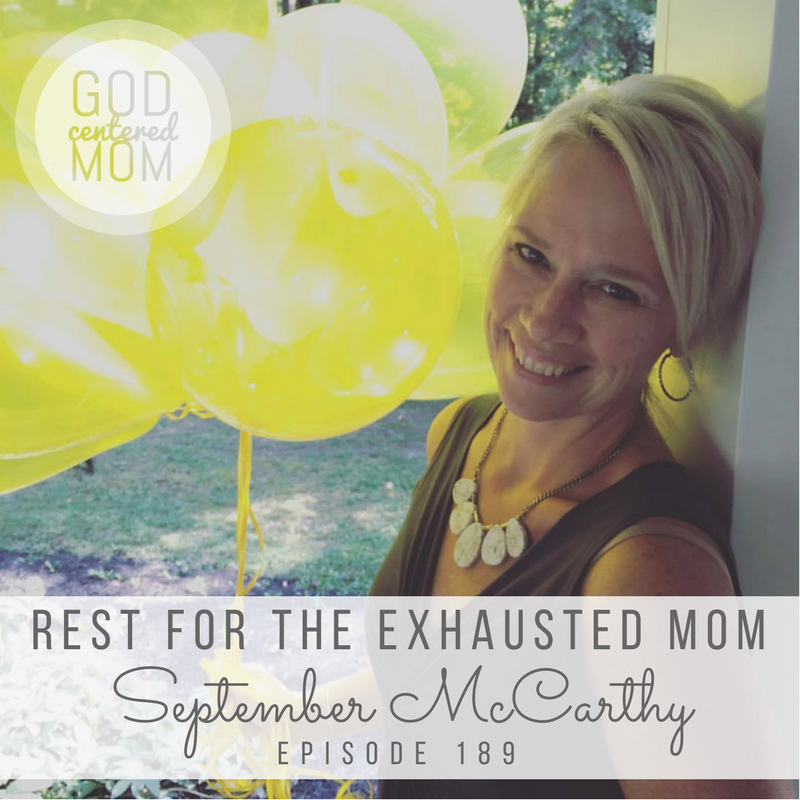 Listen as we go through questions from GCM listeners on motherhood topics including finding joy in the hard times, the value of rest and bringing your children alongside you in your work as a mom. As moms we are going to be tired. Might as well be tired over the things that bring you joy. And choose those things. September’s motherhood story including miscarriages & infant loss. Answers to questions from moms like you. Focusing less on feeling the joy in your days and more on gratitude. When you are in the busy seasons of life, be cautious what you take on. Ask yourself, do I need to do this? Not letting our “fear of missing out” for children direct our decisions. The importance of guarding our thoughts and taking negative thoughts captive. There is value and strength in rest and doing what God wants for your body. 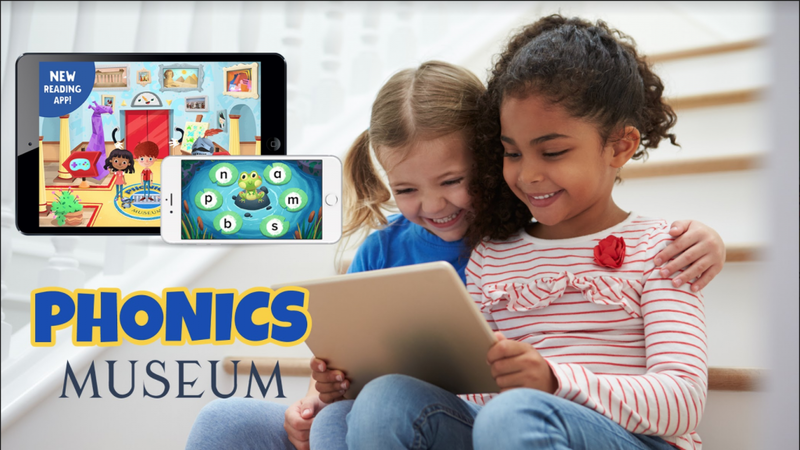 Find one to two moms who can help you when you need it. Let go of feeling like you need to everything well and enjoy it. Bringing your kids into you work as a mom and encouraging them to work as a team. Tips on teaching character to kids who want your attention all the time. I love what she said about not equating having joy with feeling good all the time. I often feel exhausted and worn out from the constant of taking care of my littles day in and day out, but that doesn’t mean I can’t have joy and be grateful for them in the midst of that! yes! so true Melinda! still hard to choose gratitude and joy in the midst of the long days. . .but life isn’t about arriving to perfection but about the journey of surrendering our comfort and convenience. thanks for listening!! As a mom with 5 children ages 9 and under, this so resonated with me. Being a wife, a mom, a homeschool teacher, someone with thyroid disease who seems to be constantly reeling from childbirth, and thoroughly exhausted with all the things, this episode breathed life into my lungs. I’m going to go back and listen to the previous episode about overcoming being an angry mom because I find myself so frustrated many days, whether it’s with myself or my children. The mention of control in this episode also perked my ears because that too is my nature. Thank you so much for this episode. I’m so grateful it was an encouragement to you Kim. Praying for rest for your soul. thank you for listening! Encouraged by September’s wisdom on rest. It’s not something to be ashamed of or feel guilt over. The suggestion to step away from tasks and commitments to heal is a really good one! As mentioned, even Jesus needed time away. One thing worth mentioning though is seeking medical and psychological help if needed for the physical and mental exhaustion. Postpartum depression and maternal distress is real and should be ruled out or treated. I think all of tips and suggestions given in this podcast is great but when a mom is breaking down emotionally and mentally it is a battle to do anything, really. With help and Biblical counsel she can see begin to see that rest is attainable and try some of these suggestions. Most definitely agree Betsy!! So many other episodes I’ve done we’ve encouraged moms to pursue counseling but definitely good to mention it in this context too! Thank you!